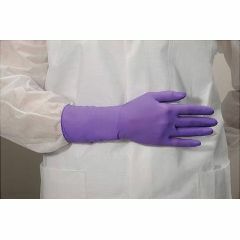 AllegroMedical.com presents The Kimberly Clark Nitrile Exam Gloves. The Kimberly Clark Performance Powder-Free Textured Blue Nitrile Exam Gloves are perfect for daily and especially exam use and are the #2 Selling Nitrile Exam Glove in the U.S. . They're a textured fingertip surface improves tactile sensitivity and dexterity. Excellent conformability provides superior fit and extended wearer comfort. They're non sterile and powder free. size runs small. I usually wear a small . but have to reorder to. get a larger size. I gave this 4 stars because I usually wear a small so ordered a small but will have to reorder a medium to get a more comfortable fit. These are very well made, are not thin like other gloves. I will order more.